A wearable camera system makes it possible for motion capture to occur almost anywhere — in natural environments, over large areas, and outdoors, scientists at Disney Research, Pittsburgh (DRP), and Carnegie Mellon University (CMU) have shown. The camera system reconstructs the relative and global motions of an actor, using a process called structure from motion (SfM) to estimate the pose of the cameras on the person. SfM is also used to estimate rough position and orientation of limbs as the actor moves through an environment and to collect sparse 3-D information about the environment that can provide context for the captured motion. 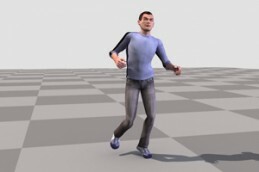 This serves as an initial guess for a refinement step that optimizes the configuration of the body and its location in the environment, resulting in the final motion capture result. The researchers used Velcro to mount 20 lightweight cameras on the limbs and trunk of each subject. Each camera was calibrated with respect to a reference structure. Each person then performed a range-of-motion exercise that allowed the system to automatically build a digital skeleton and estimate positions of cameras with respect to that skeleton. The quality of motion capture from body-mounted cameras does not yet match the fidelity of traditional motion capture, but will improve as the resolution of small video cameras continues to improve, the researchers said.